All Colors Body Shop has a great and fast turn around working with insurance or a budget you can rest easy knowing. All Colors Body Shop can handle all your auto body and paint needs. Offering a wide range of repairs from collision’s paint jobs, dents,bumpers, replacement on any vehicle parts, and more. We are a Christian based, family owned and operated, Collision center servicing customers in the surrounding counties of Knoxville, TN for almost 28 years. If you are one of those customers, we want to thank you for your business and for helping us grow our company. 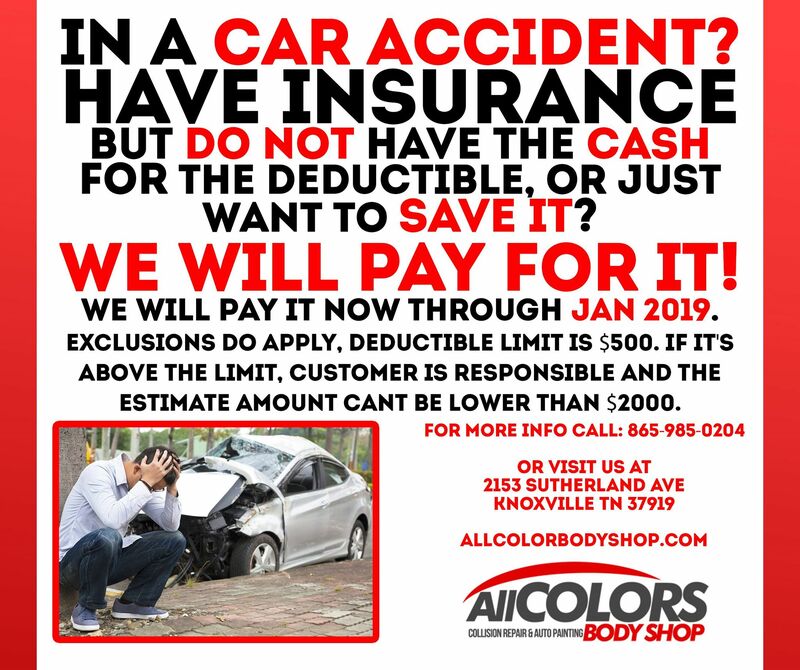 All Colors Body Shop values the trust you place in us when you leave your vehicle in our care, that’s why our pledge to you is a quality repair and a quick return at a fair price. Now with over 27 years experience, All Colors Body Shop looks forward to serving you well for many more years to come. Had a problem with my insurance but All Colors still helped me out. Great people and Service. I go to All Colors for all my auto paint needs. Good work, was preferred by Joe Neuberts to have my hail damage fixed. I will say they did an outstanding job. I would recommend to anyone. Awesome work, Friendly service, affordable prices.. That’s why i go to All Colors Body Shop. I have nothing but good things to say about All Colors. I took my car in after a accident and they returned it looking like new. Great service!! Keep up the good work!! Definitely going to refer you to friends and family.